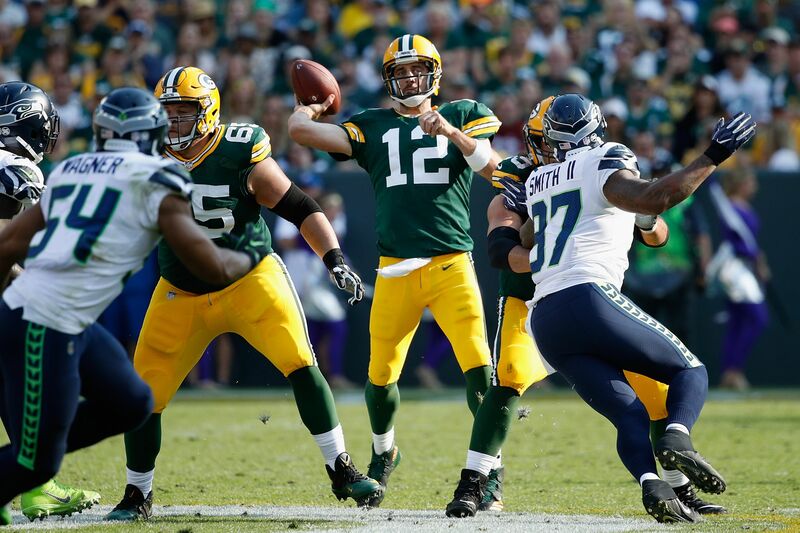 The Green Bay Packers defeated the Seattle Seahawks in Week 1, 17-9. Here are all the highlights, the game recap and the final score. It was a defensive struggle for the entire first half in Lambeau Field. The Seattle Seahawks took a slim 3-0 lead into the third quarter thanks to a Blair Walsh field goal late in the second. In short, the first half was mostly about the Green Bay Packers offensive line’s inability to keep quarterback Aaron Rodgers upright. He was running for his life behind collapsing pocket after collapsing pocket. Seattle brought the pressure throughout the ball game, struggled mightily offensively. The Seahawks couldn’t find pay dirt once on Sunday up in Green Bay. This time, it wasn’t freezing cold and the offense simply stagnated with Russell Wilson at quarterback. His offensive line didn’t help him either, as he was once again running for his life in the backfield. Eventually, Rodgers would come to life in the Green Bay passing game. Once he made that terrific touchdown pass to his favorite wide receiver Jordy Nelson, you could sense the game start to swing in Green Bay’s favor. Rodgers didn’t have his best game, but he was able to draw Seattle offsides repeatedly with some excellent hard counts. Green Bay’s strength as an offensive-first football team eventually won out, as the Packers would take a Week 1 victory over the Seahawks, 17-9. In a clash of NFC titans, this is the type of competitiveness we had hoped for. Though Seattle largely dictated terms with its tremendous front-seven, its inability to get anything going on offense wrecked the Seahawks’ chances at road upset in Week 1. Ty Montgomery: Montgomery had 19 carries for 54 yards and a touchdown. He would also have four catches for 39 yards out of the backfield. Mike Daniels: Daniels had an outstanding game for the Packers defense. He had seven tackles, five solo, four quarterback hits, 1.5 quarterback sacks and one quarterback hit. Jordy Nelson: Nelson had seven catches for 79 yards and a touchdown. The Seahawks will host their NFC West rival in the San Francisco 49ers on Sunday afternoon. Kickoff from CenturyLink Field in Seattle will be at 4:25 p.m. ET on September 17. FOX will have the late afternoon telecast. The Packers have a brutal road game in Week 2. They will have to travel to Atlanta to face the Atlanta Falcons on Sunday Night Football. Kickoff from Mercedes-Benz Stadium will be at 8:30 p.m. ET. NBC will have the primetime telecast.